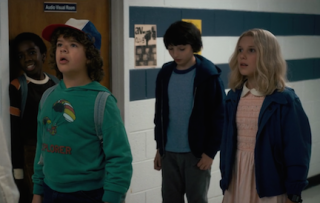 One of my favorite scenes in Netflix’s sensational sci-fi epic Stranger Things is when the ragtag crew—Mike, Lucas, Eleven, and Dustin—hide from monsters in the Audio Visual Room. In the show, technology is a shared interest and gives the characters a sense of belonging. Technology also supports the Stranger Things metanarrative that anything is possible. Hop on your radio or bike and go discover the world. The phone line is a pathway into another dimension. Since you’re reading these words right now, it’s a safe bet that you have an Audio Visual Room of your own design. Maybe the audiovisual equipment used in Stranger Things strummed a note of nostalgia. Or perhaps the ham radio and CRTs in the episodes seemed liked relics of a lost world. But as quickly as technologies change, the core tenets of AV remain the same. We are driven by a relentless curiosity and drive to tweak systems, improve performance, invent, tell stories, and—ultimately—communicate better. And though we hold on to the same governing principles as the AV pros that have come before and will follow us, certain myths remain. Take, for example, misconceptions about control rooms. How do we even define a “control room” in this mobile age as technologies continue to converge? In her AV Technology feature “13 Mission-Critical Myths”, Kirsten Nelson opines that while present-day operations centers are still the loci of intense information analysis, their setups are becoming more flexible, easing environmental stress caused by excessive noise and maladjusted visuals. Now most of the loud, hot electronics are located remotely, and UHD displays ease eyestrain and help simplify data sharing. Despite this progress, many myths about command and control systems remain in circulation. Don’t miss this feature to disprove some of those old notions. What technologies are the most shapeshifting or sci-fi worthy in your organization? Tweet me an AV Club story or your fav Stranger Things scene: @AVTechnologyMag.